Skies in Glasgow and Edinburgh are forecast to be cloudy this evening, but there could be breaks long enough to reveal the lights. 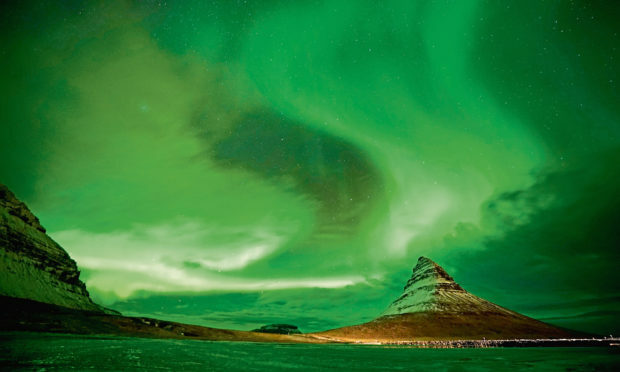 The southward shift of the lights today is caused by an ejection of plasma, known as a Coronal Mass Ejection from the Sun, which followed a solar flare on Wednesday. Bonnie Diamond, meteorologist at the Met Office, said: “A Coronal Mass Ejection has happened and the effects of that are expected to arrive later. “This type of active geomagnetic storm means that there is the possibility of the aurora borealis, commonly known as the Northern Lights. Whether or not you will see the Northern Lights depends on where you are and what the weather is like. Scotland is where you’re most likely to see it. Will Tayside and Fife enjoy Leonid meteor shower display this weekend?